After four public reviews in six months, there’ve been none in the past 10 months for the plan to fix/rebuild the city-landmarked Alki Homestead. But the site is back under scrutiny because of tree-cutting that has drawn a complaint to the city, which subsequently posted a “stop work” order so it could investigate. We learned about this Tuesday afternoon, when a nearby resident called to tell us a tree crew was at the Homestead site (2717 61st SW). She wondered why, asking whether work was finally beginning on the rehabilitation/reconstruction of the site. We went over to investigate; the crew was gone, but in subsequent hours, running late into the night, we obtained information from the city, from a representative of the coalition of historical-preservation groups that’s been watching the site, and from Homestead owner Tom Lin, who also provided photos of the trees before they were cut, and spoke with us about where the project stands, 3 years and 4 months after the electrical fire that closed the Homestead, a historic lodge open for decades as a popular restaurant. After our first visit to the site yesterday afternoon to try to find out what was happening, our original tipster told us a “cease and desist” order had appeared. We went back to look; we didn’t find it but we did find evidence on the city Department of Planning and Development website that a complaint had been filed and was being investigated. We sent an inspector out (Tuesday) after we received the complaint. It appears that four trees on site were removed. We posted a “stop work” order and required them to leave the remaining timber on site and provide us with an arborist report. At this point we haven’t determined whether the trees were considered exceptional, but we should know soon. On sites not undergoing redevelopment, exceptional trees cannot be removed unless they are deemed a hazard (via permit review process). The city’s definition of “exceptional trees,” a six-page document, can be read here. On behalf of our coalition of four local heritage organizations, I am checking in to see if you are aware of the fallen tree and power lines on the south side of the front lawn of the Alki Homestead. Apparently, the tree fell about a week ago. We are concerned about the safety of the situation. Please let us know of any action that is under way on this front. Thanks. That’s the ordinance that officially made the Homestead/Fir Lodge a city landmark in 1996; you can read it in its entirety here. And that ordinance is why Lin cannot proceed with restoration/reconstruction work at the Homestead without approval from the city Landmarks Board; any owner of a landmarked property needs approval to make changes to its landmarked features. The Homestead project has not been scheduled for a formal hearing or vote; Lin and the architects he hired for the project, Alloy Design Group, have done what most project teams do before officially going before the board – they have taken it to the board’s informal Architectural Review Committee, meeting with them four times last year to seek guidance on what the board ultimately would allow to be done, with key issues including how much, if any, of the original logs can be salvaged. Lin takes issue with the process, saying that and other issues have been gone over time and time again, and that even without rehash, there is not enough time to consult with the board, with a half-hour scheduled for any project on the agenda, even a complex one like this. Their last voluntary review with the ARC was in July 2011 (WSB coverage here). But Lin says the project has not been idle; he told us that he had just talked again hours earlier with consultant Mark Fritch, a log-home expert whose great-grandfather helped build the Homestead, has continued to do research, including a trip to Sweden last year. Lin said he and Fritch had also looked at a timber parcel that might have yielded the logs they expect to need for the project, but that the price wasn’t right. Back to the tree-cutting that the city is investigating now. Lin tells WSB he is done with that work and that no additional cutting is planned; he said the evergreen on the northeast corner of the property was only to have limbs removed, not being prepared for removal. The other trees, he said, died months after the fire – he says they all died during the same month, but were now posing a safety risk – one was on the ground, one was causing problems with utility wires, one was in danger of falling into the Homestead structure itself, as he says is shown by the photos he provided (above). At the time they were discovered to be dead, he said, he “didn’t want to chop them down” – but now, with one having come down and the others in danger of tipping into wires or the structure, he felt he had no choice. And as for the ongoing process – he says he hasn’t given up, but adds that he doesn’t have “infinite” time or money to devote to it. Yet it is not for sale, he says, while mentioning getting three inquiries this week as to whether it might be. 34 Replies to "City posts 'stop work' order after tree-cutting at Alki Homestead"
Experts are trying to determine whether the tree’s civil rights might have been violated, and looking for witnesses for evidence of mistreatment. Advocacy groups are planning a vigil for the fallen tree. Mr. Lin certainly has more patience than I would. It appears from all I have read he has bent over backwards and some folks in west seattle and the city aren’t helping his situation. If I had a dead tree near power lines it would come down or those that stopped it would find themselves in court. I prefer preservation groups that buy the properties they want preserved. All too often, they simply wish to tell you what you can do with the thing you bought but they do not wish to provide any financial help when they saddle you with obnoxious rules and regulations and legal costs because *they* they think it should be that way. There’s lots worth preserving but let’s see these people put their money where their heart is before they force their will on others. With everything that has gone on he really should have checked with the city first. How can any progress be made if every step they make is under such an intence microscope? Good Luck to anyone who wants to fix up an “Historical Land Mark” around here. Normally I’m for protecting most trees, and I support legislation to preserve trees – even on private property. However, as a professional in the field, it appears that these trees needed to be removed. They were dead and constituted a hazard. Hopefully appropriate trees will be replanted in place of the ones that taken down. I’m thinking Mr. Lin is getting screwed over. Totally agree with Jim P, Gina, and Jan S. For some reason, this story really annoys me. I hope the owner of this property can make good things happen in spite of all the hoops he is being put through. Historical societies can create all sorts of unrealistic expectations, but the bottom line is time & money. No one has an endless supply of both. That photo from July 4th kind of sums up the problem: what living deciduous tree do you know has no leaves on it in the middle of the summer? So, Lin knows that the trees are dead. He received word on April 9th that there was a problem with the known dead trees. He waits 6 weeks before doing something the problem. And despite knowing that he owns a landmark, despite knowing that the Landmark Board must approve all work to be done on the site, he doesn’t bother contacting the Landmark Board during those 6 weeks? I agree that those dead trees needed to be removed. But it seems that Lin’s issues stem more from an unwillingness to follow the process that he knows must be followed. A simple phone call or email to the Landmark Board and all of this hoohah could have been avoided. But here that does not appear to be the case and, from what I can see here, the owner did an appropriate removal. Enough of the whining about poor Mr. Lin. He KNOWINGLY bought a century old log cabin building (one of the oldest buildings in Seattle) that’s a historic landmark…and now he’s SHOCKED to find there are strings attached to what you can do, and extra regulations and…CAN YOU BELIEVE IT, there are structural problems with the building!! SHOCKING! That’s causing his problems. Is this guy the worst businessman ever? I would have NEVER bought this building unless I had cash to DUMP into it…it clearly needed work and had many limitations to how it could be modified (which limits your business options). He was foolish. If you just want to open a restaurant, then you buy a spot in a strip mall in Kent. If you buy a 100 year old log cabin building that’s a historic landmark, you’re in for a ride. He should have known better. He should have done a better inspection before buying (or realize that a century old log cabin might not be fully up to date or have structural issues). I’m tired about hearing how this poor man is a victim. That building was a thriving business for decades (off and on for a century) until he got his paws on it, and it’s been a dead decaying relic ever since. Sell it Mr. Lin, buy a restaurant in Kent or Kirkland and let someone who WANTS to take on a historic OLD landmark handle this building. Please, before this building decays any more! I agree with many of the comments: Let the trees be cut down. I love trees in the Northwest but when they become diseased or die it’s time to remove them before that create more damage. Let’s allow for common sense to prevail here and not waste time and resources investigating this. This “historical site” has become a sad eye sore, sitting there….. Doing NOTHING. It is not enhancing the neighborhood, and most certainly is NOT living up to its historical signifignce, or it’s potential of being a truly wonderful destination spot within this GREAT neighborhood. I praise Tom Lin and his vision… We are lucky to have him as a neighbor…. 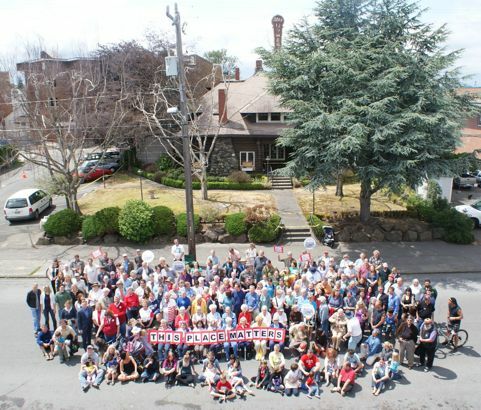 One who cares for the neighborhood, it’s ambiance, and it’s importance as Seattle’s birthplace. It’s time for everyone to let him bring this place back to being a beautiful, integral part of the Alki experience….. As it stands now, the people preventing him from doing this, are the ones responsible for it’s continued decay. How historically significant will this place be when it has decomposed to nothing more than a pile of sawdust that smells of once admired fried chicken? First the angry mob and their hateful “this place matters” intimidation. Then you have the WSB eagerly throwing gas on the fire any chance (she) gets. This guy can’t get a break. Leave him alone. With regard to the trees he cut down, the three birches in the front yard were dead months after the fire. The two trees that WERE NOT DEAD were the two old beech trees on the south side of the building. No matter what Tom Lin says THEY were alive and covering up the ugliness of the derelict building. All of us closest neighbors will attest to that and mourn their loss. I’m all for saving the trees. We need them for paper. As for Mr Lin, I applaud his efforts, but think there comes a point where one must look at the big picture and perhaps realize that with a registered historical landmark, things get infinitely more complicated. Between the neighborhood busybodies and a do nothing but get in the way local government making everything difficult, perhaps its time to sell it outright. Salty’s West, anyone? I walked past the conifer yesterday and was surprised to see several of the lower limbs down. The tree appeared to be young and very healthy, from what I saw. It certainly did not appear to be in danger of falling down, although the damage caused by the loss of major limbs could compromise its health over time. It’s a shame to see this happen if it isn’t actually necessary. Also, if all of these trees actually are diseased (which I question), this is critical nesting time for birds. Unless a tree actually represents an imminent hazard, it should be allowed to stand until early autumn. Wow. Here is a casebook study on how Seattle “Process Paralysis” festers and strangles commerce. A number of well meaning rules to protect landmarks and trees are enacted. But the specifics of how these rules are applied appear to be unclear. This lack of clarity enables people with motives outside of protecting landmarks and trees to monkey around and create loads of trouble for the owner. Cutting dead trees is not an end run around landmark or tree protection. It actually protects the landmark by removing a potential hazard. The preservation board can easily recommend planting trees to replace the dead ones. But the entire discussion did not and should not have resulted in a stop work order. Instead, the complainant should have been told why the trees were cut down and the project allowed to move on. Those of you discussing cutting down DEAD trees are missing the point here. For the people who have to look at this derelict building every day the two 80 to 100 year old BEECH trees BY THE PARKING LOT (one with a stump measuring 29 healthy inches across and the other about 24 in.) were screening this eyesore. Their healthy NEW LEAVES are all over the branches lying next to the parking lot not beside the street. The dead trees were a hazard but the beeches were NOT. Go look before you make your comments folks. It’s been four years since the fire and my guess it will sit another few before the whole thing is so rotted that it won’t be salvageable anyway. Can you imagine a hundred years from now all the people with these history groups protecting all these new condos being built. We have to save this old building still they would say. I don’t like to normally call people out like this … but the “tipster” and WSB are engaging in gossiping better kept to the forums, rather than as a posted news story. WSB is doing what WSB does…report on something. I really, really doubt that the editor of this blog is doing this just to get a rise out of people, to fan the flames of something. here’s a thought…if you don’t like what the editor does, then don’t read the story. Yes, that’s snarky.If the neighbors want something done, then put your money where your mouth is, people.Tell the city to get a move on. Raise some money so this place can be saved. Mr. Lin doesn’t have unlimited time and money. Tom Lin bought a building that hadn’t been up graded for…how many years? Yes, the woman who owned it had kept a thriving restaurant, but..what improvements to the electrical system in that building had been done before Mr Lin purchased it. None, from what I can see. He did not set out to ruin the electrical system, it was already that way. He was just damned unlucky to be the owner when it came crashing down around him, None of you gave a damn about the deteriorating conditions before that.It was fine as long as you could get fried chicken? I don’t know Mr. Lin. I did not frequent the Homestead Restaurant much. Bur there is more than meets the eye here, I believe. If this all had happened during the previous owner’s tenure, would you all be badmouthing her too? I sincerely doubt it. I think we all need to wait until the city rules on this before letting accusations fly back and forth. TR, It feels like gossiping because of the chain of events has really led to a non-story (and granted, if true rehab work had begun on the site, it would have been actual story). The significant development was the cutting down of risky trees without the proper documentation (something exercised everyday in this city). Mr. Lin has to deal with enough, without having neighbors and WSB scrutinizing his every move. I mean, the guy provided photos and passed along e-mail communications. According to the story, Mr. Eals informs Mr. Lin of the original issue, but then is quick to tell WSB that cutting down the trees may pose a problem. It seems like Mr. Lin can’t win. What the story (and minority of comments) showed me is that there are some neighbors out there who are busybodies, call the city at any hint of a violation, and use the WSB as a vehicle for their own personal agendas. P.S. Brian’s second comment came in while I was writing this reply. I honestly wish I had time/resources to report more multi-source stories in this way, and I continue to seek an experienced hard-news journalist to help with that! On Tuesday, we happened to be working on several semi-complicated stories rather than our more-common dozen or so quick hits (which still take time, to shoot photo, write copy, come up with a few links) AND there was no evening community meeting to attend, and that gave me a little more time to find out what was really going on. JanS, I agree. The editor of WSB does not have an agenda or enjoys getting a rise. I do not blame TR for following up on the initial tip. It just seems like all of the effort she did investigating amounted to something relatively minor. I read the story thinking Mr. Lin cut down some thriving trees (headline made me think that was the case), which would have ticked me off. Instead, he cut down a couple of problem trees, at the behest of the Southwest Seattle Historical Society. TR, I really am glad that WSB exists. And I am greateful for those that reach out to you with pure intent. My comments are just reserved for this story, not for WSB as a whole. Thanks for all you do, Tracy. Thanks West Seattle Blog for this product and for your efforts related to the information, news, updates and community service-related functions you provide. We appreciate your consistent dedication and the part you play in helping to keep our unique community feeling like a community.